Preheat your oven to 375 (or 350 degrees convection). 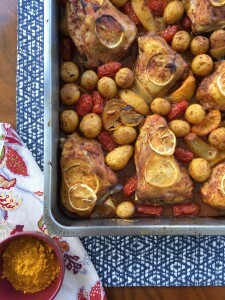 Take your chicken, lemon wedges, tomatoes, potatoes, onion and olives and place in a large roasting pan. Drizzle your olive oil and sprinkle your garlic, turmeric, cumin, paprika, salt and pepper over the chicken and vegetables. Using a gloved hand massage the spices and oil onto all of the items in your roaster. Make sure everything is well coated. Arrange everything nicely in the pan and then take your remaining lemon slices and lay them out onto your chicken thighs. Cover the roasting pan and cook for 1 hour. Then remove the cover and cook for an additional 15 minutes. This dish can be prepped the day before you want to serve and then cooked the day you want to eat. Alternatively, you can cook the dish the day before for 1 hour covered and finish cooking the day of serving uncovered for 20 minutes.